Mark's Note: Today's post is a guest post that's written for manufacturing settings. But, I'd challenge healthcare readers to think about how the impact of wasted motion and time for nurses and other healthcare professionals running around to get their own tools, supplies, and equipment. Think of a “tool crib” as a clean utility room, medication room, or supply room, except it's staffed by a person who retrieves items for workers. How can we reduce waste to allow our staff to provide the best patient care? When you can't do your assembly job because you or your buddy are missing an important tool, that's not very efficient and you're hurting your company's production goals – two important aspects of lean manufacturing. Unfortunately, living with missing or misplaced tools is a way of life for tool crib managers – the unsung heroes of the industrial workplace. Who are these guys? They're responsible for hundreds of thousands of dollars worth of tools. They maintain inventory, verify receipts for purchases, monitor spare parts and drive forklift trucks. They must lift 75 pounds safely, be responsible for their own personal protection equipment (PPE), repair and recalibrate tools and are expected to demonstrate excellent organization, customer service and communication skills accommodating every request when needed. With hundreds of workers spread out over multiple shifts, the tool crib manager is busy. While no two tool cribs are exactly alike, they all share a need for improved organization, whether it's to prevent theft or manage inventory. Shelves, drawers, cabinets, locks and hooks are used to store and organize tools which range from hammers and screwdrivers to highly sophisticated calibration and test equipment. Typically, a manufacturing facility tool crib is a separate room with limited access administered by one or several persons. On off-shifts, selected foremen may have keys to the tool crib. 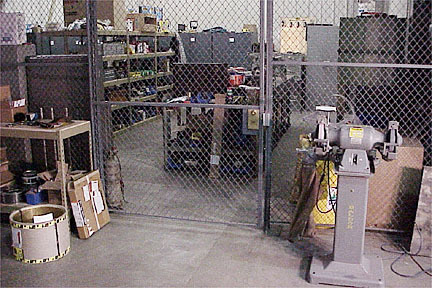 In larger facilities, there may be several tool cribs. Managers run tool cribs many different ways depending how many tools need to be tracked, which kinds of tools need to be tracked, how many shifts are employed at the company, who has access to the tool and whether tools stay on site or go off site. Fortunately, there are high-performance labeling supplies to help tool crib managers sort, manage and identify tools. Scannable bar code labeling, for example, is widely used in tool cribs. Bar code label supplies come in multiple high-contrast colors, allowing for color coding and bar coding using the same label. They use aggressive adhesive and provide the multi-year life spans needed for heavy industrial applications. “All our items are identified with bar code labeling. Tool cribs are physically secured and all items issued are scanned to an employee's identification badge,” said Danny Smalley, Gulfstream Aerospace Corporation. Printing black and white employee identification photos on clear or white vinyl is helpful, too. Magnetic supply is movable and durable, and can be extremely helpful in a warehouse environment. Tool crib managers can create custom labels, apply them to metal drawers or shelves and then just lift up the label when needed. Custom labels are also great for pipe marking and arc flash applications. Tamper proof/tamper-evident destructible tapes are also worth noting. Tamper-evident VOID tapes permanently record the word VOID onto the label's adhesive and leave a lasting mark on adhering surfaces. This prevents labels from reuse as incorrect identifications. But the bottom line is that you have to know what you have, where it's going and where it's been. There are three strategies used to conquer mismanaged tool cribs. Solution One: Free to Roam. Believe it or not, some companies have a free-to-roam system. If you need a tool or a part, you just go in and get it. This can get a little out of hand, so some give keys to only a select few. Solution Two: Stocked and locked. Only tool crib clerks have access to the tools. Solution Three: Count the inventory – over and over again. Some companies cycle-count 3 – 5 times a week. What will the tool crib of the future look like? From a visual communication perspective, expect to see mobile print stations, touch screen monitors, all inclusive OSHA-ANSI compliant software and rugged supplies which will perform under the harshest conditions including mines, construction sites, warehouses, distribution centers and oil rigs. This posts forgets what I see as the number one problem with tool cribs: operators leaving their work stations to fetch tools. In some machine shops, you see a line of machinists waiting in line at the tool crib while machines and work pieces stand idle. Instead, in a Lean shop, the tool crib sets up milk runs to pick up worn tools and deliver fresh ones. It is a support organization with the purpose of supporting production, not disrupting it. True, doing something in a “lean way” that you shouldn’t necessarily be doing isn’t the best approach. With Lean in hospitals, the tendency is to stock supplies closer to the point of use (the patient room) instead of having nurses go running to a clean utility room. Organizing the utility room versus changing the supply chain… that’s often the choice to make.